Finally, after a long wait of ten years, India managed to put it across Australia on their soil. The win at Adelaide is the first after 2008 when Anil Kumble had led India to a win at Perth. This was also the first time India had won the series opener. It must give their campaign a huge boost and will definitely give them a psychological edge over the Aussies. The difference between the two sides in Adelaide was the disciplined and solid batting by Cheteshwar Pujara. Other Indian batsmen got starts but could not convert them. Indian bowlers also put in a stellar show. Virat Kohli failed in both innings – a rare happening. But Ajinkye Rahane displayed his class in the second innings. Rohit Sharma must learn not to be impetuous. He is too classy a player not to succeed at the Test level. But the familiar problem of India not able to get rid of the opposition tail once again reared its head. In fact, when Australia was chasing for a win, India had them on the mat but allowed the tailenders to make a game of it. 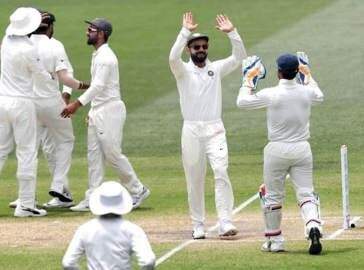 In the end, though India won by 31 runs, it showed that Indian bowlers must think of a strategy to quickly end the Australian innings once the top order is dismissed. Having won the first Test against a depleted Australian side – Steve Smith, David Warner and Cameron Bancroft are banned and not playing – India must now aim to win their first series in that country. The team has the talent and the resources to achieve that. There is no doubt that the Aussies are going to come back hard and their bowlers have the potency to unsettle the Indians, but Indian batsmen will have to show grit, determination and discipline to give their bowlers good scores to defend. Only then will a series win be possible.